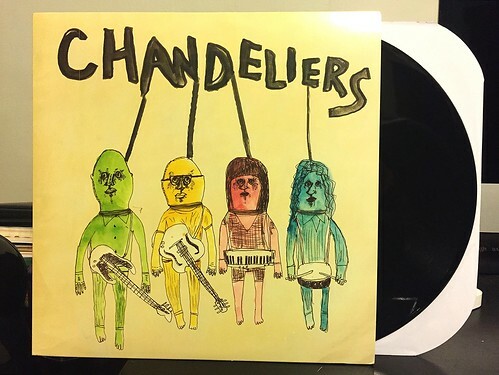 I Buy Way Too Many Records Dot Com: Chandeli'ers - S/T 12"
This record is a few years old, but it just ended up on my radar recently courtesy of a tweet from the fabulous Dead Broke Rekerds. All I needed to listen to was the first 30 seconds or so of the opening track "Sweet Time" and this was an immediate purchase for me. The lightly distorted guitar with the bouncy riffs and mod-ish tendencies immediately made me think of the band Smalltown and that's all I needed to convince me to buy this 12". The rest of this EP has some ups and downs, at least as far as song tempo goes. The other two tracks on side A slow things down a bit but the alternating boy/girl vocals are wonderful and create some killer harmonies. The B side picks the pace back up and at times reminds me a little bit of the poppier moments of The Ballantynes, especially with the prominent keyboards. Chandeli'ers is a really easy band to listen. They simply write good, catchy songs. The rumor is these guys are working on a full length for next year and this EP has certainly built my anticipation to hear more from these guys.